BRING YOUR BOAT TO ORANGE BEACH! Free boat slip included! With white sandy beaches and inviting, warm Gulf water, Orange Beach has been a family favorite for generations. Enjoy fishing, specialty shops, boutiques, day spas, and fine cuisine served in a relaxed setting. The back bays and inlets provide a great place to fish for speckled trout. And because it is near the Pass connecting the Gulf and bays, The Pass at Orange Beach is the perfect location to launch a sport or deep-sea fishing boat. Boating and fishing are naturals in this relaxed community. The sunrises slowly each morning in a brilliant display. Gold skies give way to pink, pumpkin and finally the blue of day. If you are lucky enough to be here at this hour, you’ll hear the familiar call of seagulls hanging in the air. You may glimpse a brown pelican breaking the water’s surface in a brief, but impressive splash. The sand beneath you, smoothed from its night’s rest, carries you to the water’s edge. At mid-morning, children can be seen scurrying along the beach like ghost crabs. Armed with bright buckets, they re-shape the sand to form castles with moats and turrets. Their imagination is without limit. And for a moment, so is yours. Such is the enchantment of this place called Orange Beach. Boat Slip, TVs (five), VCR (three), Non-Smoking, DVD (five), Stereo with Surround Sound, Fifth Floor, Approximately 1990 square feet, Oversized Balcony (425 square feet) off Living Area and Master Bedroom, Second Balcony off second and third Bedrooms, Ice Machine is located at Wet Bar, Jacuzzi Tub with Separate Shower located in Master Bath, and Private Boat Slip (FREE of Charge). Ask about long term leases available on this unit. Awesome views from the condo. The best in Orange Beach! Condo was huge and clean. Metri was very helpful. 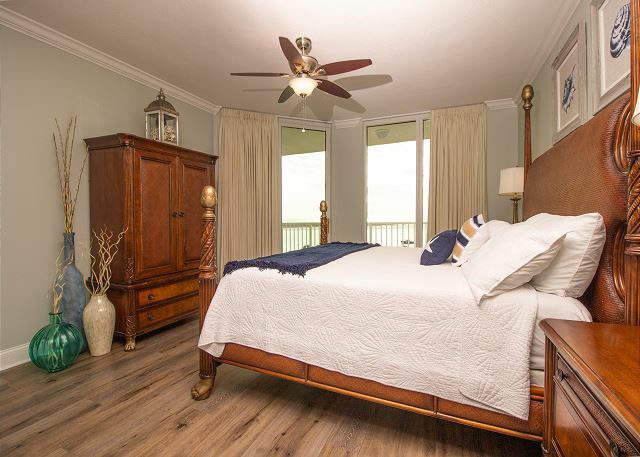 Lots of room, clean, nice location to beach access, restaurants, shops etc., wonderful gulf and inlet view from large balcony, very visible security team which is a plus, plenty of parking, comfortable beds and all around good place to stay. Note that the media room is basically an extra bedroom. It had a pull out sofa for the kids (I didnt try it out but the kids slept great on it) and sliding doors for privacy. Metri, our rental contact, was eager to help us if something came up. To sum it up, 509 is a place that I would book again. We enjoyed Thanksgiving weekhere. There were 9 adults in this unit and we never felt cramped. Everyone enjoyed watching the different boats going by, dolphin, and even the Blue Angels! 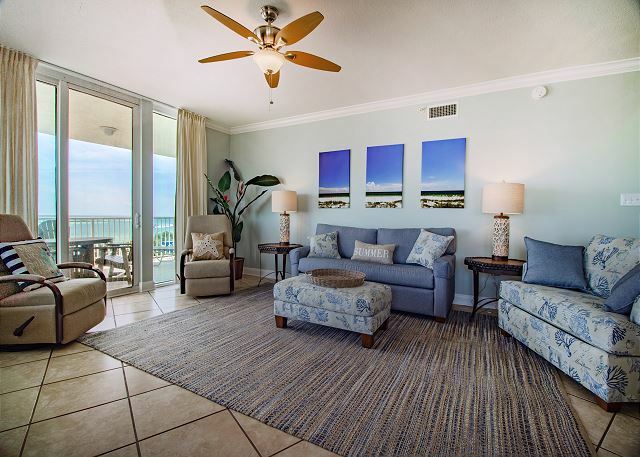 Every window has a view of the water and there is more than just a gulf view. Watching the sunrise every morning was spectacular. We will definately stay again! we had our children and grandchildren and had a ball! It is great for us because we stay on the water. This is our second year at this unit; there has been no updating so it is a bit tired. When we arrived the ice maker was broken-a major inconvenience for us--it should have been repaired or replaced for our stay. 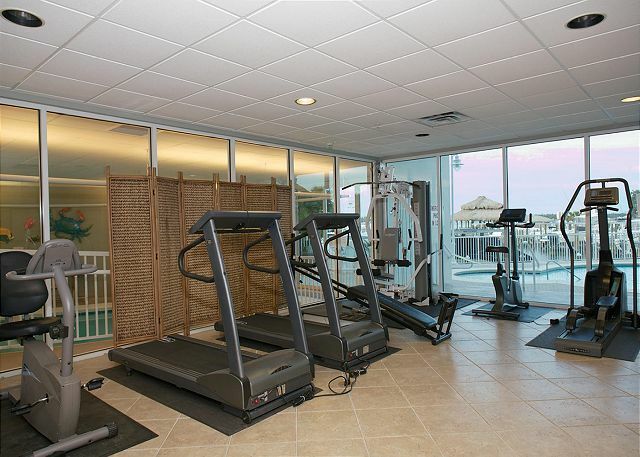 Even though this unit is roadside it has a great gulf and pass view we love the property and we love the location. I just wish the furnishings were freshened up and everything was in good working order. We certainly will consider this property as we plan for our 2018 trip. Another Great Stay at the Pass! This was our 2nd trip back to the Pass and, as expected, we had a great trip. Metri was wonderful and we are already planning our trip back for next year! We shared the condo with another family and we all fit comfortably. We had beautiful views of the Gulf and all of the boats on the lagoon. We saw dolphins every day on the beach behind the condo!!! The condo was perfect for our large family. And Metri made everything so seamless for us. This condo was wonderful. It was very clean and was very roomy. The view was wonderful We were notified and kept informed by Demetrious. He was wonderful. He even left us a pie in the refrig to welcome us. he called to check and make sure everything was to our liking. Afterwards he even had to mail our daughter her laptop and look for something my husband thought he had left. I would definitely recommend this condo!! We had a very pleasant stay at the PASSAGE and would recommend it to friends and family. we had a 4 bedroom condo that was great, the beds were comfortable, only bad thing is the bottom sheet was not for a high mattress and the corners would come off during the night. the 2 chairs in the living room need replacing. The manager Demetious was great, he was there when we needed something taken care of. we are sorry we are not able to stay there in 2017 as they rented it before we were able to confirm before we left. We enjoyed the pool and workout room. i love The Pass. The view from every window is beautiful. This place is well stocked in the kitchen equipment. It is very comfortable and was just what we needed. Demetrius, the property manage was very accommodating. He delived a key lime pie upon check in. He is always just a phone call away. 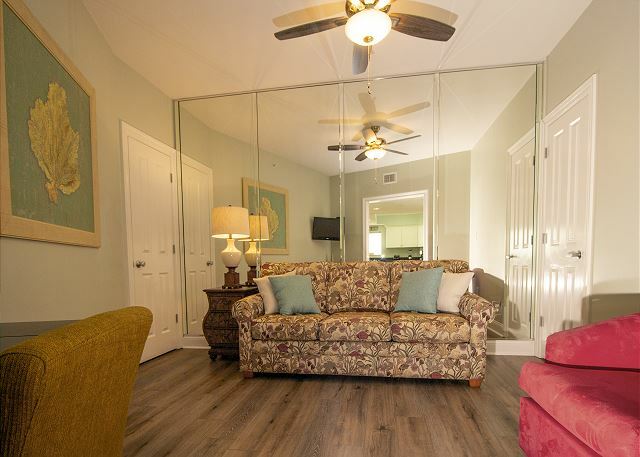 If you are heading to Orange Beach and need plenty of room for 8-10 people, this is your place. There is an indoor and outdoor pool which is an added plus. This location is easy to get in and out. Five sisters and two brother in laws enjoyed the beautiful sites, foods of Orange Beach, Alabama for our yearly sister vacation. 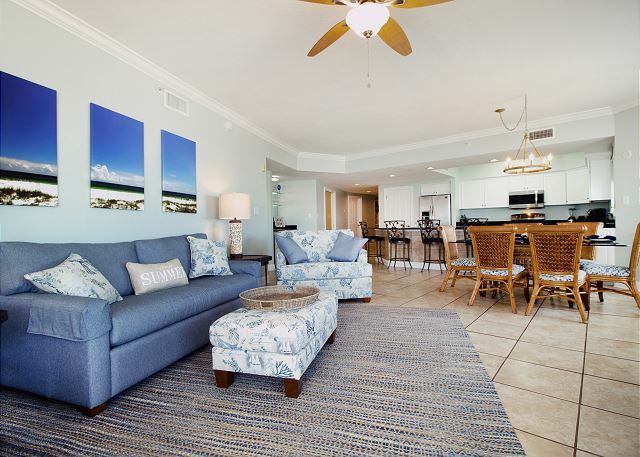 We enjoyed the beautiful condo, swimming in the pool and laying on the white sandy beaches, not to forget the wonderful shopping, watching the dalphins and just spending time with each other. Can u believe five sisters can get together, stay seven days and not get mad. It was a great trip for us. Great eating placees and also the fresh seafoods were wonderful. Demetria was great. He had everything in order even a great lime pie. He even Helprin us when my sister's car tore up. Have to thank him more than we can say. Look foreword to coming back and have already told our friends about ur condo and the wonderful service we received. Thanks again. We were really really pleased with the condo complex and unit. In the morning it was nice having coffee and watching the boat traffic out of the Pass. It was truly laid out well and we loved all the sunshine coming thru all windows and of course the view. 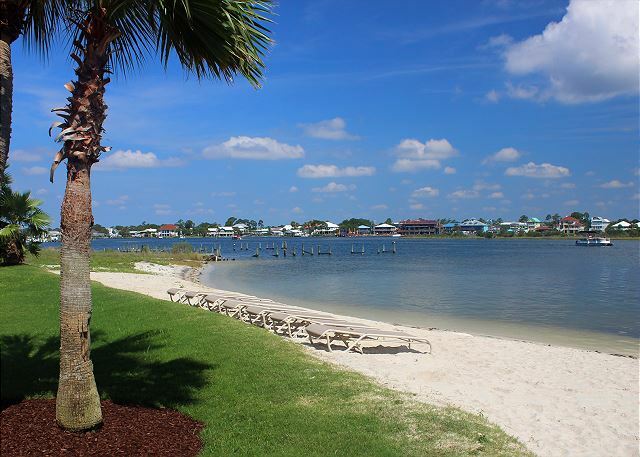 The location was perfect for Orange Beach, it was very close to everything. We would definitely come back. Our two families stayed at The Pass#509 during our Easter break. 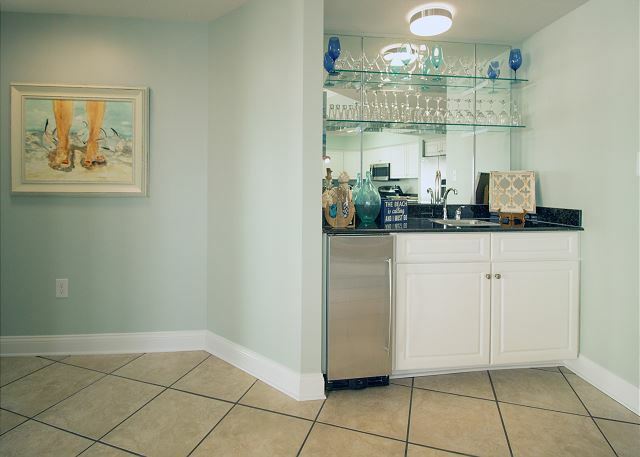 We were very impressed how clean the condo was and we loved all of the space for our two families. We enjoyed our wrap around balcony and the view of the ocean truly was breathtaking. We appreciated the peacefulness of the condo and were glad it only has 6 floors. The people we spoke to outside or in te elevstor were friendly and welcoming. However, no one was more welcoming as Metri. He gave us a warm welcome and gave a real personal touch to our stay! We enjoyed the key lie pie from him along with the advice on the area as far as entertainment, restaurants and beaches. The kids swam in the pool everyday, usually more than once! Most of the time the kids even had the pool to themselves! We would pack a beach bag and head to the beach over the bridge. One day we drove to one of the public beaches in Gulf Shores, but most of the time we went to the beach near us - it was less crowded and convenient. There are bathrooms there too. Oh, I should mention that onenight we grilled out on the lagoon side. It was so pleasant eating outside. As we were enjoying our meal in the tiki hut, all of a sudden, a family of dolphins started jumping right in front of us! We were so excited! A few more perks: you can walk to great restaurants like The Gulf and Fiddlefish. You can even walk to the catholic church and get your hair or nails done at the Aveda salon nearby. All in all, we had a fabulous time and can't wait to return next year! Thanks, Metri and owners for sharing your home with us. Loved our pleasent and enjoyable stay at the Pass. Very nice. Thank you for the key lime pie a real treat to start our stay. The condo was really nice except it could use some new living furniture. The complex is quiet, well kept, easy to get to things and the people are very friendly. The condo is large, room for everyone to spread out and not be crowded. We had 9 people, 6 adults, 2 teenagers and 1 10 year old, plenty room. Could not use the pools too cold first time we rented a condo and could not use the pools. 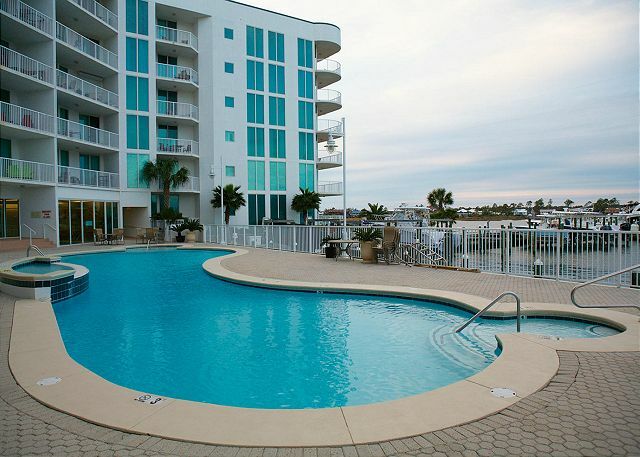 We spent the first week in October in Orange Beach staying at Pass #509. The property was easy to get to and clean. Our group included four adults and four children and there was plenty of room for all of us. There are no words to describe the beauty and serenity of this condo and its location. We spent a lot of time on the balcony watching the boats pass through. There is a small private beach and we enjoyed sitting out there every night counting the stars. 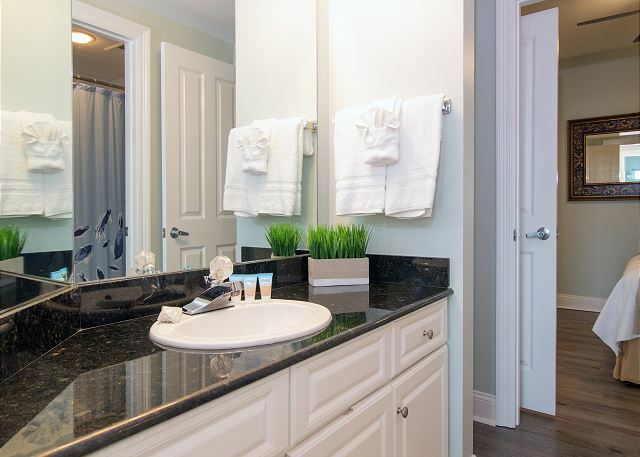 This condo is truly a home away from home with everything you could possibly need. We loved our week here and we cant wait to return. Fun and relaxation at its best! The condo was beautiful. And very well maintained. Metri was the best he came over to meet us. He was very personable, we consulted with him on places to eat. Always just a call away whenever we needed advice. My family just loved it! Thank you so much!!!! I heard my granddaughter say this place is better than Disney World! She along with her sisters and cousin laughed, looked at stars, watched boats, catching marine crabs on the beach, try to a choice between indoor- outdoor pools, catching fish including a sting ray right off the Pass private beach~ ohhh so much more they did! It was a good place for my grandkids, adults children, and us as grandparents!! Even with it not being directly on the gulf beach, we still were able to enjoy as if it was! 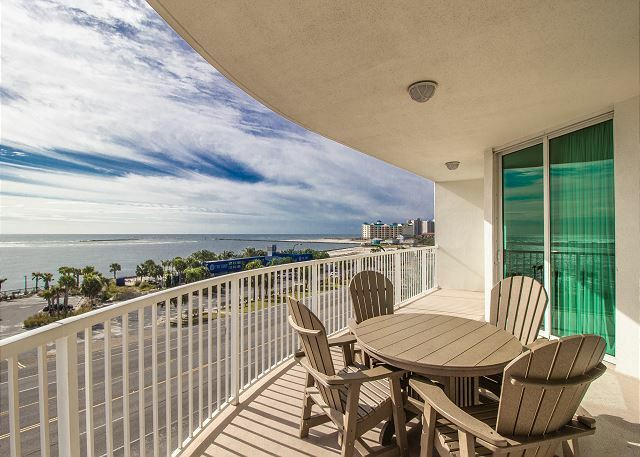 I 've stayed at several condos in Gulf Shores and Orange Beach and 509 at The Pass is definitely the best. 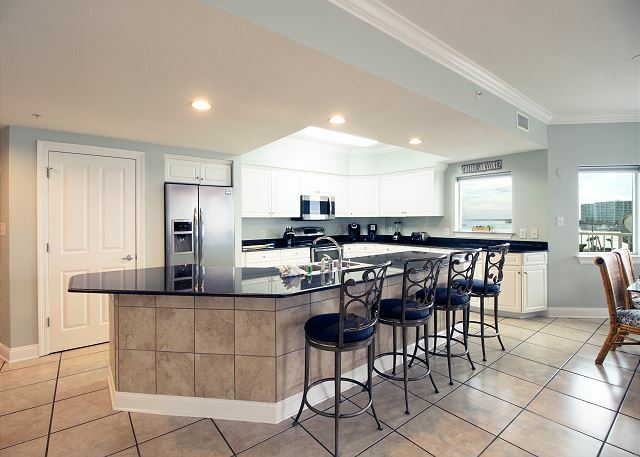 Great condo with beautiful views !! Two families shared this 4 bedroom condo during the first 2 weeks of July. We found the condo clean and very serviceable. The location was excellent. We participated in a July 4th celebration at the condo. Everyone brought food and it was fantastic. The management and security at the condo were very friendly and would assist you in anyway they could. The views from the condo were exceptional. I would recommend this to my friends. Meetri went out of his way to make our stay was great.Unit 509 was nice,clean and large enough with a view. We will be back, soon. I had a very good time there! Would recommend it to anyone. Location was great, views were wonderful. Large condo great for large faimily. It was wonderful. Having the boat slip really made it special and what can be said about the views other than exceptional! We had plenty of room for everyone. The condo was well stocked with everything we needed. Demetrious was very helpful and the pie that he gave us was great. Our fire alarm went off, it was defective,we called him and he came over and installed a new one. There was a problem with one of the TVs and he bought a new one and replaced it. We had a very relaxing family vacation. We will probably go back to the Pass. The only thing I missed, was the location and not being able to hear the waves. Beautiful condo with awesome views with a wrap around balcony. The condo was big enough you could have a family reunion. It sleeps at least ten people easily. Loved it and thanks!! We enjoyed our stay at the Pass In August 2013 very much. Our 3rd visit.We had plenty of room and our host Demetrious was there when we had a small problem. He took care of everything very professionaly, was always courteous. The kitchen was nice and we cooked a few meals and found everything we needed there.We love the place and hope to go back th the same place next year.Thanx Demetrious! You're the man! Everything was great except that one night we have some one complain that we were making to much noise at 8 PM, when quiet time is after 10 PM. All we were doing is playing a board game with family, very disappointed. Fantastic stay in "509". The views from condo are the best in area. The condo manager is without doubt the best we have ever dealt with. 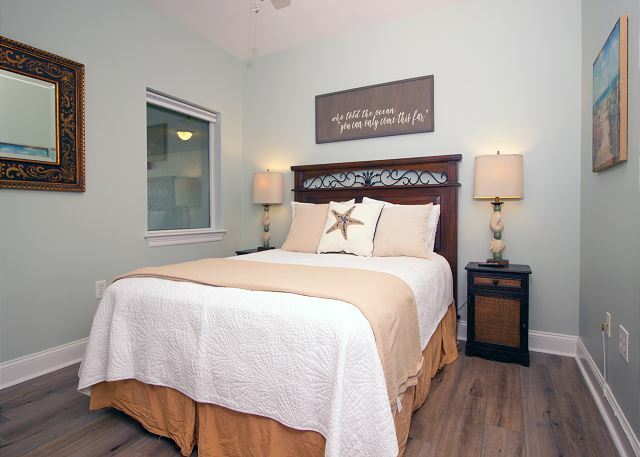 Great restaurants and shopping are within walking distance of just a short drive. Looking forward to returning in 2014! VERY NICE. METRI WAS VERY PLEASANT AND WILLING TO BE HELPFUL.